155 mm/60 3rd Year Type4 х 3 pcs. Musashi — Japanese Tier IX battleship. A Yamato-class battleship, Yamato’s only sister ship to be commissioned. Just like Yamato, Musashi was the biggest warship of World War II. Upon completion, and in contrast to her subsequently modernized sister ship, she had more powerful secondary battery guns, but weaker AA defenses. Musashi was first released for sale worldwide on 17 January 2018. Musashi is the sister ship to Tier X Japanese battleship Yamato. As one might expect, the two share many commonalities. However, Musashi is a tier lower than her sister ship and somewhat weaker as a result. She retains the class's fearsome 18.1-inch guns, but sacrifices some general accuracy to do so. Her AA suite is also severely lacking compared to powerhouses like the Missouri, Iowa, or Friedrich der Große. Everything considered, captains that have played Yamato will know what to expect from Musashi. Both share key features such as their armor layout, health pool, stealth (or lack thereof), and speed. The two play very similarly, and overall feel quite comparable. That is not to say that they are entirely similar however, as Musashi sacrifices two main things for her down-tiering. First and foremost, she takes a massive reduction to her anti-aircraft suite. It would not be an exaggeration to say that the single largest threat to any Musashi captain will be an enemy aircraft carrier, as they can strike her with near impunity regardless of the tier of their planes. Even an up-tiered carrier such as Hiryu or Ranger will have no trouble pushing home a bomber strike against Musashi. The severity of this weakness is somewhat mitigated by her astoundingly good torpedo belt — Musashi, like Yamato, has the joint best torpedo protection in the game. Captains should still keep this downfall in mind, as positioning themselves next to a ship with strong AA could mean the difference between sinking or staying afloat while a carrier is in play. Yamato’s biggest strength is her guns and this also holds true with Musashi, but with one major difference. While Yamato has the best sigma value in the game at 2.1, Musashi has only has a 1.8 value. Sigma as a value only affects the shell groupings of a volley, causing them to trend towards being closer together as the value grows higher. Simply put, the higher the sigma, the tighter the shell groupings. There will always be outliers where shells go nowhere near a targeted ship, and even a ship with cataclysmically low sigma can have good accuracy as long as the dispersion value is similarly good. Put into context, all of that means that while Musashi is not inaccurate — she has the same dispersion value as Yamato, after all — her shell groupings simply won't be as tight, on average. Other than these two things, Musashi also has a very high and easy to hit citadel. Captains should actively avoid close passes against enemy battleships and heavy cruisers, and avail to angle towards enemy ships at all times. It's inadvisable to get caught up in the ship's expansive main battery range either, as her guns lose most of their effectiveness past the 15 km mark. Veterans of Yamato are likely already familiar with the quirks of how these ships play. Musashi is essentially a weaker, downtiered Yamato. They work the same for the most part, sharing the same strengths and a few of the same weaknesses. She is not a radical departure from general battleship play, and should be very comfortable to anyone who enjoys Yamato. 460 mm (18.1") guns are capable of penetrating the bow armor of every ship in the game at any range due to overmatch mechanics. Current best DPM of the Tier IX battleships when Main Battery Modification 3 ( ) is installed. Very long range on the main battery guns. Long range secondaries; can reach up to 10.6 km with the proper build. Tight turning circle for a battleship. Tied with her Tier X sister, Yamato, for the best torpedo protection. Largest hit point pool at Tier IX, and second largest in the game. Strong, reliable armor when angled properly against enemy ships; very strong horizontal armor offers protection against American AP dive bombers (still vulnerable to Graf Zeppelin AP bombs). Fairly good accuracy on her main battery. Increased uptime and decreased cooldown on both Spotting Aircraft ( ) and Catapult Fighter ( ) consumables. Better rudder shift than her sister, Yamato. Painfully slow turret traverse of 2.5 deg./sec. She is slow, and cumbersome with a large turning circle, slow rudder shift, and low top speed. Half of her secondary battery fires AP, which struggles to do damage to angled targets. Tall flat sides make her vulnerable to citadels from broadside targets. As a Premium ship, Musashi doesn't have any upgrades to research. Key skills for all Musashi commanders include Priority Target, Expert Marksman, and Superintendent. For commanders focusing on secondary armaments, key skills include Basic Firing Training, Advanced Firing Training, and Manual Fire Control for Secondary Armament. For commanders focusing on anti-aircraft armaments, key skills include Basic Firing Training, Advanced Firing Training, and Manual Fire Control for AA Armament. For commanders focusing on maximum survivability, key skills include Basics of Survivability, Fire Prevention, and Concealment Expert. Premium versions of Damage Control Party ( ) and Repair Party ( ) are recommended, as Musashi will often be detected and drawing fire. Captains can choose between the Spotting Aircraft ( ) or Catapult Fighter ( ) depending on personal preferences. Both of her aircraft consumables have increased uptime and decreased cooldown compared to other battleships. As a Premium ship, comes included with Type 10 camouflage that lowers her detection radius, reduces the accuracy of incoming shells, reduces her repair costs, and increases the amount of experience she earns. As a battleship, the Musashi has 8 slots for signal flags. Standard flags to take as a battleship are India Delta ( ), November Foxtrot ( ), and India Yankee ( ). These flags help increase the survivability of the Musashi. In addition, Sierra Mike ( ) will help the Musashi go slightly faster and Mike Yankee Soxisix ( ) will boost the power of the already strong secondaries. Musashi and Yamato anchored in Truk Lagoon in early 1943. The Yamato-class battleships were the next class of warships designed by the Japanese Navy after a long hiatus due to the ratification of a plethora of interwar naval treaties. But by the 1930s, Japan’s increasingly expansionist policies came under scrutiny by the League of Nations. To the world’s shock, Japan decided to withdraw from the League, which also meant she didn’t have to adhere to the aforementioned treaties. The Government understood that her empire would come into conflict with the United States, and devised plans for countering this new, potential threat. Knowing that Japan couldn’t out-produce the US, the IJN opted to make individual ships that were superior to their US counterparts. Design work on this new class of battleships commenced in 1934, the year Japan pulled out of the League. The ambitious project started out with a selection process of 24 designs. The three most integral components were the ones that were under intense selection: armor, armament, and propulsion. The ideas for propulsion were uncharacteristically creative at a time when turbine power was staple. Many considerations of diesel and hybrid-diesel systems were considered due to the promise of greater endurance. Ultimately, it was narrowed down to conventional turbine propulsion, as previous experimentation with diesel propulsion for a capital ship proved problematic. The system – at such a scale – was highly unreliable, and to replace major components required the removal of many appliqués of armor. As well, the displacement was finally pegged at just under 66,000 tonnes, making this the largest battleship ever constructed, and with such allocation of space, the designers were able to authorize the implementation of 18.1-inch caliber guns as opposed to a more traditional choice of 16-inch guns. By 1937, the designs were finalized, and the construction of five Yamato-class battleships was planned. The ships were imposing beasts; as ambition fueled much of the design process. From the get-go, the idea was for such a vessel to engage multiple capital ships simultaneously. To do so, it required the armor to maintain sustaining power in a firefight. The belt was no less than 16 inches, and the bulkheads were a tad thinner at 14 inches. The top was capped with a plate about 9 inches thick, made of composite materials consisting of a variety of composite materials consisting of various heavy metals; not traditional rolled homogeneous steel. Furthermore, the armored deck incorporated sloping to save on some weight without compromising on protection. But the thickest plates were not on the sides, but found on the faces of the turrets, at an impressive thickness of 26 inches at most; they were truly impregnable from the front. The novel technique of arc welding was used in the construction process. Its use was justified, as not only was the seams between the armor plates were even tighter, but it also allowed for designers to attach a larger lower armor belt than with previous methods. The scheme was not perfect though. While the torpedo protection system on paper looked impressive on paper, in actuality the performance was subpar. The bulges were adequate in their performance, but the seam between the upper and lower belt was directly underneath the bulge, which was shown to be prone to rupture upon impact. To move such a heavy vessel, the class used 12 Kampon oil-fired boilers, which fed to 4 turbines. This generated an impressive 150,000 shaft horsepower, but it was not enough to break the 30 knot mark; shy by three knots. This was a compromise the designers were willing to take, but went against their venerated belief of speed is key. This drawback prevented the battleships to keep pace with fleet carriers in combined-arms action, as fuel consumption would be unsustainable. The most characteristic feature of these massive ships was their choice in armaments. Welding nine 18.1-inch guns in three triple-turrets; two super firing in the front, and one facing the rear. This gave the battleships the ability to hurdle 13 tonnes on ordinance onto a target up to 42 kilometers away at a pace of 1.5 - 2 salvos per minute. The hope was that such firepower would be sufficient to deter aggressors from taking action; a feat of intimidation not hard to believe. Supplementary, the ships initially carried twelve 155mm dual-purpose guns in the form of 6, twin-gun turrets; three on each flank of the main superstructure. Additionally, the Yamato-class carried a dozen 127mm AA guns in 6, dual-mounts, and twenty-four 25mm AA guns in 8, triple-mounts for defense. By 1944 it was understood that the anti-aircraft firepower of these ships were severely handicapped, and the class underwent modifications. Two of the secondary turrets were removed, and in their place, another 12, 127mm guns were added and a whopping 138, 25mm guns were added. Musashi (武蔵), named after the Musashi Province, was the second ship of the class to be completed, and the last to be completed as a battleship, as intended. Built by Mitsubishi Heavy Industries in Nagasaki, she was laid down on 29 March 1938, and launched 1 November 1940. She was commissioned into the Imperial Japanese Navy on 5 August 1942. After 4 years of immensely secretive construction, super-battleship Musashi was commissioned into the Imperial Japanese Navy on the 5 August 1942, joining the 1st Battleship Division alongside Nagato, Mutsu, and her sister-ship Yamato. Stationed at Nagasaki, she spent the rest of 1942 working up. She officially joined the Combined Fleet on 15 January 1943, under the command of Admiral Isoroku Yamamoto. She arrived at Truk on 22 January, and replaced Yamato as the Combined Fleet’s flagship on 11 February. She remained at Truk until mid-May 1943, where she sortied to the northern Pacific in response to American attacks on Attu Island, but failed to make contact with American forces. She sortied a second time with an even stronger fleet shortly after, but was called back to Yokosuka after failing to reach Attu before the American forces re-captured it. On 23 May, she embarked Yamamoto’s ashes and carried them to Tokyo for a formal state funeral. After returning to Yokosuka for thorough inspections, she was visited by Emperor Hirohito and his staff during late June. She returned to Truk on 6 August, resuming her position as flagship of the Combined Fleet, now under the command of Admiral Mineichi Koga. Her next big sortie came on 17 October 1943. Having intercepted American radio traffic suggesting another raid on Wake Island, Musashi sortied from Truk at the head of a powerful fleet including five other battleships, three carriers, eleven cruisers and several dozen destroyers to intercept the American carrier force, but once again Musashi and her fleet failed to find the American fleet. She spent the remainder of 1943 at Truk Lagoon where she functioned as the command ship for the region. She finally left Truk on 10 February 1944, when she returned to Yokosuka. After Yamato and Musashi were reassigned from the First Fleet to the Second Fleet, Musashi embarked several thousand men of the Imperial Japanese Army and the Special Naval Landing Forces and their equipment and set sail for Palau, arriving by the 29 February where she remained until late March. On 29 March, Musashi departed Palau in the dead of night to avoid a potential air raid, but was discovered by submarine USS Tunny, who fired off six torpedoes at Musashi and scored a hit on her port bow, tearing open a 5.6 meter diameter hole and flooding her with 2,630 tons of water. Before she sailed from Palau, Admiral Koga had departed Musashi via plane for the Philippines to set up a new headquarters at Davao. His plane was caught in a typhoon, and Koga perished. After repairing her torpedo damage, Musashi set sail for Kure, managing 24 knots under cover of darkness. She entered dry dock at Kure on 10 April 1944, where the hole in her bow was properly repaired and her anti-aircraft armament suite was substantially increased, with her 155mm wing turrets being removed to make more room for 25mm triple-mount AA guns; her AA firepower was further improved by the addition of 4 more radars. In early May 1944, Musashi departed Kure bound for Okinawa, joined by six aircraft carriers and four destroyers. She moved to Tawi-Tawi by 12 May, joining Vice Admiral Jisaburou Ozawa’s fleet alongside Yamato. She sortied towards Batjan on 10 June, preparing to launch a counterattack against the Allied invasion of Biak. Two days later, after receiving news of American attacks on Saipan, Musashi was diverted to the Mariana Islands, joining Vice Admiral Takeo Kurita’s Second Fleet on arrival. She was present for the following Battle of the Philippine Sea, but was not attacked. Following the disastrous defeat at the hands of the numerically and technologically superior American Fast Attack Forces, Musashi and the survivors returned to Japan. On 8 July, Musashi and Yamato embarked 3,500 men and set sail for Lingga Island off Malaysia, arriving on 17 July. Musashi remained at Lingga performing training exercises until 18 October 1944, when she sailed for Brunei Bay in Borneo to join the main Japanese fleet building up for the planned counterattack against American landings at Leyte. Musashi, at the head of Kurita’s “1st Diversion Force”, set sail for the Philippines on 22 October. While transiting the Sibuyan Sea through the Philippines on 24 October, Musashi’s fleet was spotted by American reconnaissance aircraft from American carrier USS Intrepid (CV-11). Two hours after being initially spotted, eight Curtiss "Helldiver" dive bombers attacked Musashi with 1,000-pound bombs; one struck her No.1 Turret, though it failed to penetrate. Shortly after, a torpedo dropped by a TBM "Avenger" (also from Intrepid) struck her starboard amidships, tearing a hole and flooding her with 3,000 tons of water; Musashi developed a 5.5-degree list to starboard. During this initial attack, two Avengers were shot down. An hour and a half later, another eight Helldivers from Intrepid fell upon Musashi, this time with two bombs hitting; one failed to detonate after striking the forecastle and penetrating two upper decks before passing through the bow flare above the waterline, while the second penetrated her top two decks and exploded in the middle deck, disabling several of her portside AA guns. Two minutes later, nine more Avengers attacked Musashi, putting three torpedoes into her port side amidships. She pushed her engines up to her hampered top speed of 22 knots and opened fire with all her guns, including firing anti-aircraft Type 3 shells from her 18” guns. An hour and a half later, 29 more aircraft attack Musashi. Five Helldivers scored two near misses, while six Avengers scored four more torpedo hits. One of those hits struck just forward of Turret No. 1, causing a massive internal explosion and rendering most of the ship’s interior bow inaccessible. After the third attack wave, Musashi’s speed had fallen to 20 knots, and she had sunk almost 13 feet into the water. Nevertheless, all her guns, including her two remaining main battery turrets kept firing on the American aircraft. An hour after the third attack subsided, a further 69 American aircraft began yet another attack on Musashi’s fleet. At this point, Musashi was leaving a trail of oil in the water and appeared to be barely managing 8 knots. The first nine Helldivers from USS Enterprise (CV-6) scored four 1,000-pound bomb hits: three on the port bow and the last destroying the chief steward’s office. Eight more Avengers attacked Musashi yet again, scoring an additional three torpedo hits that appeared to leave her dead in the water. Musashi slowly worked back up to 16 knots, but was continuing to flood below the waterline. After counterflooding to stabilize the ship, her speed fell to 13 knots. A mere ten minutes later, 75 more planes descended upon Musashi’s fleet, 37 of them directly targeting the mortally wounded Musashi. Ten Helldivers attacked her, scoring three more hits and further destroying Musashi’s AA armaments. One of these bombs penetrated the bridge and detonated in the operations room, killing several of Musashi’s high-ranking officers and totally annihilating the compartment. Three more bombs struck Musashi’s superstructure, then two more. At this point, almost all of Musashi’s superstructure was either destroyed or in flames. Twelve more Avengers fell upon her again, scoring eleven hits; gradually, her speed fell to a mere six knots. By 16:21 on 24 October 1944, 259 aircraft had attacked Musashi’s fleet, and Musashi herself had absorbed 19 torpedo hits, 17 bomb hits, and 20 near-misses from bombs. Still, Musashi stubbornly refused to sink. Throughout these attacks, Musashi’s damage control parties had put in herculean effort to keeping her afloat, but by the late afternoon she was listing to port by ten degrees and had settled more than 26 feet into the water. In a desperate last-ditch effort to save her, all free hands and wounded men on board assembled topside starboard to counteract the list, and all consumables and timber on board are loaded onto the starboard side. Rear Admiral Toshihira Inoguchi personally went below decks to flood the crew’s spaces on the starboard side, several boiler rooms and the starboard outboard engine room. Inoguchi considered attempting to beach Musashi, but by that point her engines had stopped entirely. By 19:15, Musashi was listing twelve degrees to port, and Inoguchi gave the order to “standby to abandon ship”. His executive officer, Captain Kato Kenkichi, assembled the crew on the aft starboard deck. The battle flag was lowered; Admiral Inoguchi retired to his cabin, and was not seen again. By 19:30, Musashi was listing thirty degrees and slowly began to roll over. Captain Kato gave the orders to abandon ship and to remove the Emperor’s portrait. Destroyers Kiyoshimo and Hamakaze moved in to rescue 1,423 survivors, including Captain Kato, but 1,023 of her 2,399 man crew were lost (including Rear Admiral Inoguchi, who was posthumously promoted to Vice Admiral). At 19:36 Musashi completed her roll to port and capsized. As the ship’s stern sank beneath the water, the aft turret fell off and two explosions were heard. The surviving sailors and officers were taken to Manila Bay, where they were designated the “Kato Regiment” after he name of their surviving second-in-command, Captain Kato, and joined in Japanese defensive operations both on land and at sea until the end of the war. On 31 August 1945, Musashi was removed from the Navy List. Musashi’s wreckage lay undiscovered for more than seventy years, despite several attempts. It was finally located in March 2015 by Microsoft co-founder Paul Allen and his team of researchers in the Sibuyan Sea under more than 900 meters (3,300 feet) of water. Musashi is depicted in her original 1942 condition. Her 1944 configuration is not represented. 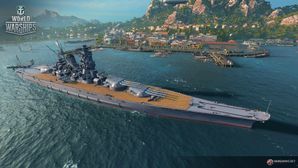 Musashi’s historical overall dark gray paint scheme is missing. This was standard on all IJN warships beginning in 1903 until the end of World War II. A simple solution would be to demount the premium camouflage, but players will not benefit from the camouflage's bonuses. Light and dark green camouflage was only applied to aircraft carriers beginning in mid-1944; Musashi is in 1942 configuration. Mitsubishi F1M floatplane is missing; the Aichi E16A was only equipped on Hyūga and Ise. Musashi leaving Brunei in October 1944 for the Battle of Leyte Gulf. Musashi, August 1942, taken from the bow. The curvature of the deck is dramatically visible. A view of Musashi’s bow in mid-1942. Taken from high in the superstructure, sailors are engaged in calisthenics. Taken from nearly the same vantage point as the previous photo, this is a view aft. Note the catapults are trained out over the stern. Right elevation drawing of Musashi as she appeared in 1942. Musashi as she appeared in mid-1944. Yamamoto's ashes return to Japan aboard Musashi, 23 May 1943. Emperor Hirohito and his staff on board Musashi, 24 June 1943. 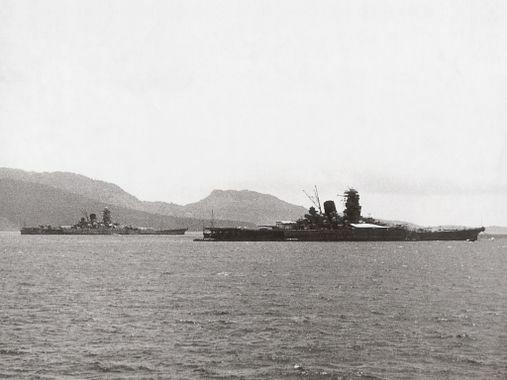 Taken in Brunei prior to departure for Leyte in October 1944, Musashi is distant left. The Japanese fleet leaves Brunei in September 1944 to confront the US landing on Leyte. The battleships in rear of line are, from left to right: Nagato, Musashi, and Yamato. Musashi maneuvering under air attack, 24 October 1944 in the Sibuyan Sea. Note the soot-blackened decks and turret tops. Musashi under heavy air attack, 24 October 1944. Another view of Musashi under heavy attack, 24 October 1944. Note the very heavy, very dark smoke being produced; a consequence of unrefined or minimally refined fuel oil obtained in Brunei. Musashi under attack by American carrier aircraft from Task Force 38 in the Sibuyan Sea during the Battle of Leyte Gulf. Musashi down by the bow after the air attacks, shortly before her sinking. This page was last modified on 7 February 2019, at 22:04.